Please click on image to be re-directed for on-line purchase. 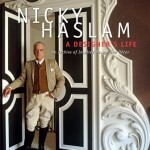 A Designer’s Life, Nicky Haslam has delved into his scrapbooks and design archive to share the key moments in his career and the myriad inspirations for his decorating style, glamorous designs and creative ingenuity, all brought to life by his amusing anecdotes and astute observations. A Designer’s Life is being published by Jacqui Small Publishing on 20th November 2014 and Rizzoli worldwide in March 2015. Folly de Grandeur, Nicky Haslam invites us into his own celebrated country home, describing its history, the design aesthetics he has used in its decoration, the furnishings, the eclectic collections, and the secrets of the garden rooms that complement the indoor space. Redeeming Features, A Memoir. 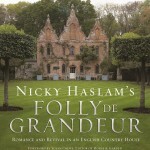 A dazzling and witty account of Nicky Haslam’s heady life – in London, Paris, St Tropez in its heyday, New York, Arizona and Los Angeles, recounting meetings and friendships acquaintances with virtually all the flamboyant and cultural icons of our time. The critic A.N. Wilson has commented ”Masterpiece is a overused word, but Haslam’s Proustian evocation is indeed a masterpiece”. 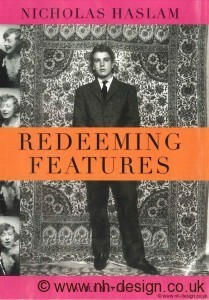 Redeeming Features was published simultaneously by Jonathan Cape and Knopf worldwide in early November 2009. 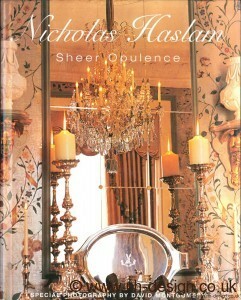 Sheer Opulence is a tour of Nicky Haslam’s grand, glamorous and witty interiors. Never content with mere minimalism, or overblown elaboration for its own sake, a Haslam interior has exhilarating chic, and a shimmer of opulence that instantly attracts the eye and remains in the mind. Re-published in Soft cover Spring 2010. A second book, provisionally entitled Par Excellence, is planned as a companion volume to Sheer Opulence.